Here are five geographical puzzles for you to solve. Don’t consult a map, and don’t scroll downwards until you have solved [or tried to solve] all five. These puzzles were first published in Rolf Palmberg: ”Geographical themes”, IATEFL Voices issue 219  p. 7. You are travelling along a European road. It’s 2 o’clock in the afternoon. About 10 kilometres to the west, in a neighbouring country, it’s 3 o’clock. About 10 kilometres to the east, in another neighbouring country, it’s 4 o’clock. What time is it in Madrid, Spain? You are standing on the Dutch-French border. What is the name of the nearest international airport? You are on the northernmost tip of a small, nameless island in the Mosel River. Most of the island (about 90 %) is owned by France, but the tip of it, where you are standing, is owned jointly by two of France’s neighbouring countries. Looking north, you see cars on a nearby bridge crossing the river. Which two countries own the bridge and what is the name of the village that westbound cars are about to enter? You are in Stockholm, Sweden, and want to fly your helicopter to the nearest international tripoint, i.e. the place where the borders of three countries meet. Which European tripoint should you head for? One day, while staying in a hotel in the Spanish town of Irun, you are told by the receptionist that the island in the border river of Bidasoa is Spanish. You borrow a boat, go to the island, and for some reason decide to stay there until the next morning. Returning to your hotel on the following day, you are told by the same receptionist that the island is French. What is the name of the island? 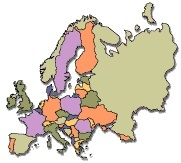 To test your knowledge of European tripoints, click here. The only place that fits these criteria is the road leading south from the Norwegian town of Kirkenes towards the Finnish-Norwegian-Russian tripoint (the place where the borders of Finland, Norway and Russia meet). Since Norway and Spain are in the same time zone, it’s 2 o’clock in Spain, too. NOTE, however, that Russia moved to permanent Standard Time, or ‘winter time’, on October 26, 2014. From this date they will remain on Standard Time [winter time] until further notice, meaning that from now on, this puzzle is applicable only for six month a year! There is no Dutch-French border in Europe, so you have to study a map of the Caribbean islands. The two halves of the divided Dutch-French island of Sint Maarten/Saint-Martin are both integral parts of their respective homelands, so the Dutch-French border does exist. Since Saint-Martin (the French part of the island) has no international airport, the answer can only be Princess Juliana Airport in Sint Maarten (the Dutch part). Part of the Mosel River (including a number of bridges crossing it and the northernmost tip of the island mentioned in the puzzle) forms a condominium that is owned jointly by Germany and Luxembourg. Going west on the bridge takes you to the famous village of Schengen in Luxembourg. You should head for the Estonian-Latvian-Russian tripoint. The island is Conference Island (Île de la Conférence in French) a.k.a. Pheasant Island (Isla de los Faisanes in Spanish). France and Spain each administer the island for six months of the year and then hand over control to the other. You happened to spend the night on the island on the date of such a handover.